We use our calves- specifically the gastrocnemius (the bulky part of the muscle) and soleus (the lower portions of the muscle) - in just about every activity that includes our legs – walking, running, standing, etc. Working out these muscles is not just for body builders and athletes. Exercisers of all levels should include calf exercises into their workouts because these muscles are important not only for improving the sculpted, symmetrical look of our legs, but also in helping us maintain balance and stability, especially as we age. The loss of strength and power in the calves has been suggested as one of the leading causes of slips, trips and falls in elderly populations, so any calf strengthening we can do now may help reduce the risk of falls later on. Other leg exercises like squats and deadlifts are great, but they do not necessarily increase the strength of the calves, especially if you ‘push through the heels’ while squatting. Click here to see why pushing through the heels takes your calves out of the equation. 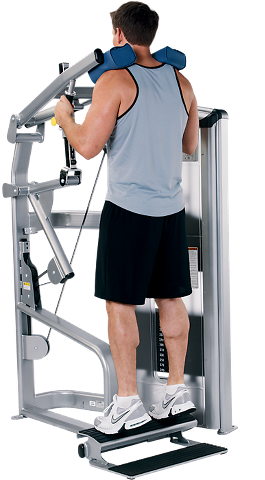 To learn more about the VR3 standing calf raise machine, or the complete line of Cybex VR3 strength equipment, click here.